Do you know what a water strider is? Perhaps you’ve seen one or a group of them skating across the surface of a pond. Why don’t they sink? 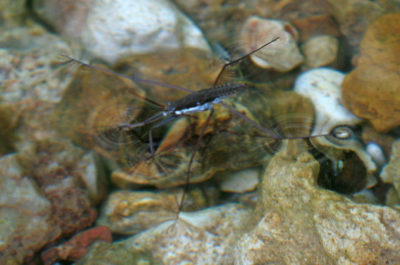 Water striders prefer quiet areas of streams and ponds. They scavenge food like drowned insects floating on the water surface as the striders appear to skate their way along. The reason water striders can walk on water is one of the special things about water. Every liquid has a place where the liquid stops and the air begins but the water surface is tough. Question: What is special about the water surface? A single drop of water on a penny doesn’t spread out. It holds together in a tight high half sphere because of water surface tension. The water holds together under that water surface so tightly that even ten drops doesn’t cover the entire penny. A needle is a flat piece of metal but it still sits on top of the water surface. The meniscus is the reverse of the water drops with the lowest part in the center and the highest parts going around the edge. A little soap changes the shape of a drop of water a lot as this drop on a penny shows. The water surface is no longer that high tight form but a flattened puddle. Twenty drops of water make a penny look like a dome with the rounded water surface. What do you think the water surface is doing as the drops pile up on the penny? Does this explain why the needle can sit on the water in the bowl? Does this explain why a water strider can walk on water? Why can’t a cat or dog walk on water? In the jar water still has a small meniscus but much less than the plain water had. Compare the meniscus or dip on the surface of the water in the jar of plain water and soapy water. What does the soap seem to do to the water’s ability to make this surface layer? Ten drops of plain water didn’t touch the edges of the penny but ten drops of soapy water do. Could a water strider walk on soapy water? After setting up the penny I put one drop of water on the center. The drop didn’t spread out. It stayed in a high found half sphere. I thought I could put 25 drops of water on the penny before it ran off onto the paper towel. This was much less than the 36 that did sit on the penny. Ten drops later the water didn’t even touch the edge of the penny. The water stayed in the high round half sphere. Twenty drops later the water finally touched the edges of the penny. The water was still in that high round half sphere. The water seemed to hold itself together like it had a skin on it to hold the liquid inside. Thirty drops of water bulge upward and outward on the penny. The half sphere kept getting higher until 30 drops of water were piled on the penny. Drop 36 finally made the water run off the penny. My needle floated on top of the water. The surface of the water seemed to make a dip around it. It was like the skin on the surface of the water molded itself around the needle. This water skin on the surface would hold up a water strider or other small insect. A large insect or animal like a cat would be too heavy breaking the skin and sinking. The water in the jar was lower in the center than around the edges. The edges seemed to almost climb up the jar. Since so many drops of water sat on the penny, I thought at least 30 drops of soapy water would sit on the penny. This was far too many as only 22 drops did. The first drop looked a lot different sitting on the penny. The drop was more spread out and not as high. Ten drops of soapy water didn’t quite go to the edges of the penny but took up more room than the plain water had as it was wider and not as tall. Twenty drops of soapy water barely stay on top of the penny. Fifteen drops of soapy water went to the edges of the penny. The next six drops made the water taller but it was flatter than the plain water. Drop 22 made the soapy water run off onto the paper towel. When I tried to put the needle on the surface of the soapy water, it sank immediately. I dried the needle and tried again but the needle would not float on the soapy water. The dip in the water in the jar was less. Water didn’t seem to try to climb up the sides like the plain water did. The soap seems to stop the skin from forming on the water surface. Without that skin to stand on, a water strider would sink just like the needle did. We know now that everything is made up of atoms and molecules. Water molecules have two hydrogen atoms attached to an oxygen atom. These three atoms don’t line up flat. Instead they form an angle with the oxygen atom at the point. This lets the water molecules line up ≪≪≪≪<. The oxygen atom likes the hydrogen atoms near it so they hang onto each other. This is especially true at the water surface. The surface becomes very tough, for molecules and is called surface tension. It lets the water surface curve and climb up the side of a jar a little ways. It lets insects like water striders walk on it. Soap breaks up this lining up of water molecules. They can’t hang onto each other any more. The surface tension gets weak so even a water strider will break through. This entry was posted in Outside Project and tagged meniscus, science, surface tension, water on June 22, 2016 by [email protected].